Abstract: An autonomous vessel can improve the intelligence, efficiency and economy of shipping logistics. To realize autonomous navigation control of underactuated vessels (USVs), this paper presents a controller that can make USV track a reference trajectory with only 2 inputs, i.e., surge and yaw. A nonlinear state-space model with 2 inputs considering environmental disturbances induced by wind, current and waves for a 3 degree of freedom (DOF) surface vessel is considered. Based on this model, a trajectory tracking controller using Nonlinear Model Predictive Control (NMPC) is designed. System constraints on inputs, input increment and output are incorporated in the NMPC framework. 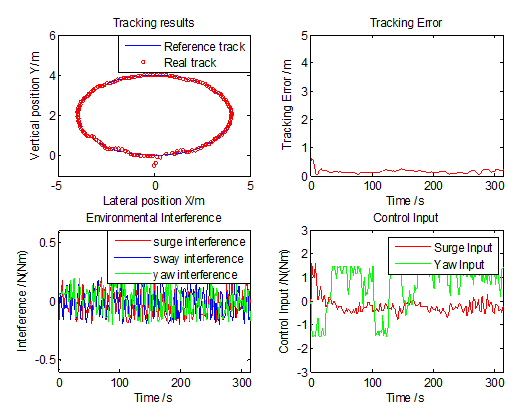 Simulation results show that the controller can track an ellipse trajectory well and that the tracking errors are within acceptable ranges, while system constraints are satisfied. Reference: C. Liu, H. Zheng, R.R. Negenborn, X. Chu, L. Wang. Trajectory tracking control for underactuated surface vessels based on nonlinear Model Predictive Control. In Proceedings of the 6th International Conference on Computational Logistics (ICCL'15), Delft, The Netherlands, pp. 160-180, September 2015.